This is my first time doing Mug Swap, which is basically like secret santa with mugs – and in August. It’s also pretty similar to the favorite things swap I participated in previously. Here’s what I came up with for my partner. I was going for a beachy theme which is convenient, since I live in a beach town, err.. city. 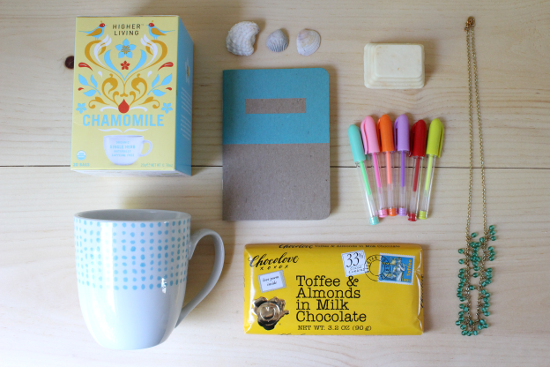 The tea and mug were from Home Goods and that notebook is a Scout Notebook – cute, right? I found the miniature gel pens at Target and the chocolate bar at a local organic grocery store. The soap (above the pens) was a DIY from this post and the necklace was a project from this WhimseyBox kit. Lastly, the shells are from one (or more) of our days spent at the beach. I hope the recipient likes what I chose! Did you (or have you) participated in Mug Swap? If so, spill the details of your box! Psst.. You can see many other Mug Swap participants and their gifts by checking out #mugswap14.